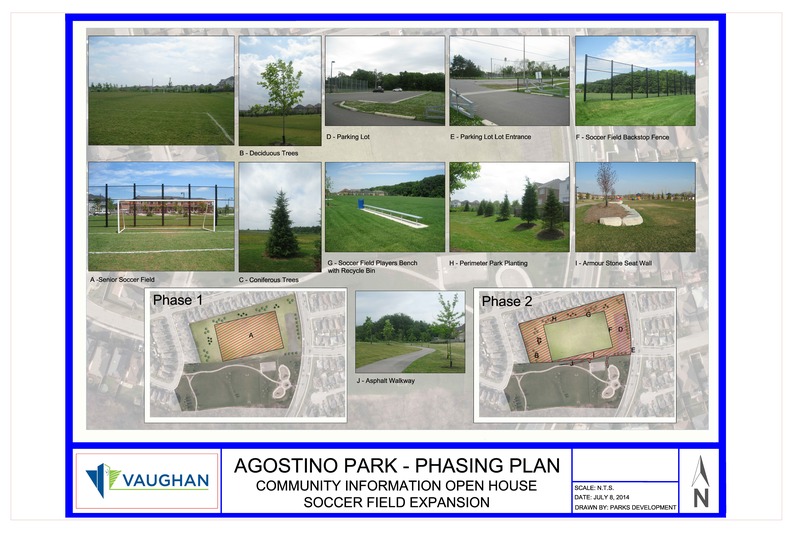 Home » Sandra's Blog » Agostino Park Expansion Coming This May! 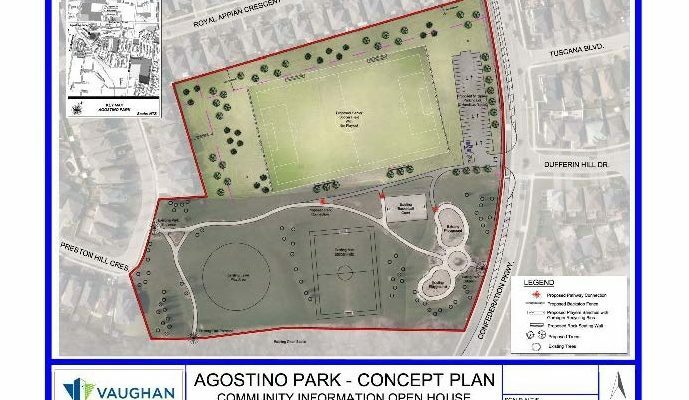 When the York Catholic District School Board released the site in 2013 back to the Developer, I had requested that the City look at purchasing the land to expand the park area with features and services that were in demand. I worked with staff as part of the budget process and pushed with my colleagues to ensure the land was purchased to expand the parkland in this neighbourhood. Once the land was purchase, Recreation Services staff reviewed the Active Together Master Plan and the types of recreation services that were in demand. Parks Development staff drafted Concepts Plans that reflected the service demands and presented these plans at a community open for resident feedback. Here was the draft plan presented. On July 8, 2014 a community open house was held at the North Thornhill Community Centre and was well attended by the general public. 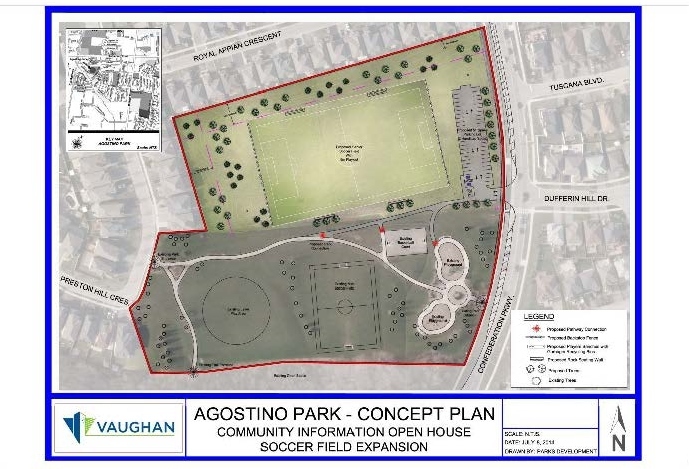 This meeting was advertised via City Web Page, letters mailed to local residents (250 metre radius from park site) and meeting information posted on a mobile sign positioned at Agostino Park. All in attendance at the meeting were provided a hard copy comment sheet and comments were also able to be submitted via email or online on the City’s Web page. At the community open house, attendees were given the opportunity to review the proposed concept boards and ask staff questions or provide comments directly to staff. The open house forum was facilitated by the Parks Development staff in consultation with Parks Operations and Development /Transportation Engineering staff. Written comments were required to be submitted by July 22, 2014. Requests were received to improve the existing park facilities, such as the playground equipment, playground safety surfacing, basketball court, walking paths and site furnishing (trash/recycling and benches), including accessibility improvements. Staff reviewed these concerns and incorporated the upgrades in accordance to the yearly budget. The expansion includes a new senior soccer field, parking lot to address on the current on street parking, walkway extension and walkway lighting. Click on the photo for a larger version of the detailed map. The Contractor began is work last Fall preparing the land for the projected work. This project was shut down for the winter season and will resume when weather and site conditions permit working. Work is scheduled to start back on site the first week of April and complete the remaining work by the end of May. The remainder of the work includes the installation of a natural turf senior soccer field and parking lot.